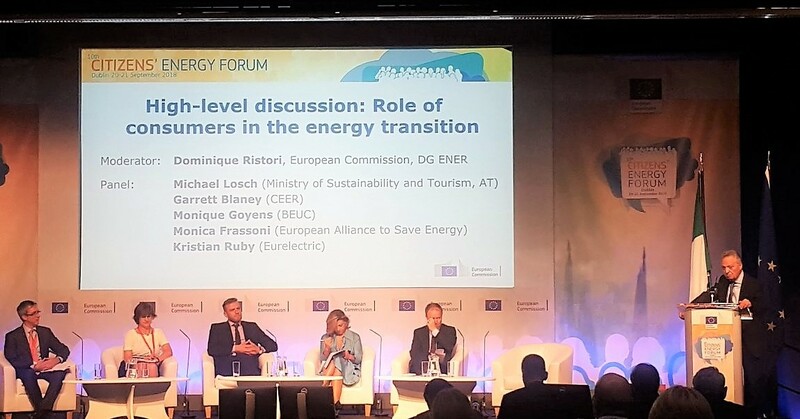 The EU-ASE President Monica Frassoni attended the 10th Citizens’ Energy Forum, which was launched by the European Commission in 2008 as a dedicated platform to implement and enforce consumer rights on the energy market across the European Union. Organised annually, the Forum has served to structure the debate and channel consumers’, regulators’ and industry’s views on the energy market and its future, directly feeding into the work of the Commission in the energy and consumer policy areas. This year’s forum aimed at placing the discussion on the role of consumers on the energy market in the context of the measures proposed by the Clean Energy for all Europeans package and the recently adopted New Deal for Consumers package. The opening session started with the speech of Dominique Ristori (DG ENER) which was followed by Denis Naughten (Minister for Communications, Climate Action and Environment), Miguel Arias Cañete (European Union’s Commissioner for Climate Action & Energy) and Sean Kelly (MEP), who agreed that the on-going negotiations and the implementation of the Clean Energy Package should keep focus on placing the empowered consumers at the center of the energy transition. EU-ASE President Monica Frassoni was invited to take part in the High-level discussion on “The Role of consumers in the energy transition”, together with Michael Losch (Ministry of Sustainability and Tourism, Austria), Garrett Blaney (CEER), Monique Goyens (BEUC) and Kristian Ruby (Eurelectric), and moderated by Dominique Ristori (DG ENER). During her intervention, Ms Frassoni stressed the importance of the inclusion of the energy efficiency first principle in the Regulation of the Governance of the Energy Union as a key novel element that will help ensure that the consumers are able to play an active role in the energy transition. “Energy efficiency first is not a PR concept, but a principle that should guide the implementation and investment decisions” she emphasized. Regarding the Clean Energy Package for All Europeans, she stressed that some progress has been made with the adoption of the recast Energy Efficiency Directive, but underlined the need to increase the energy efficiency target by 2023, as a possibility given by the upwards revision clause. “Citizens need to be involved to ensure a transparent discussion on the choices that are being made when it comes to decisions between investing in new infrastructure or more retrofitting” she stressed, and pointed out the difference of these choices in terms of their financial impact but also in terms of their impact on citizens health and the quality of life. Ms Frassoni informed the audience about the European Commission’s Impact Assessment, which stated that every percentage point increase in the 2030 energy efficiency target would mean lifting millions of people out of energy poverty and called on the Commission to show more ambition in the future. In her intervention she also gave an example of very low interest for green mortgages and stressed the need to create the sense of urgency among consumers that more ambitious legislations is needed and that that it is good for the consumers, their quality of life and for the environment. EU-ASE President concluded by stressing that the European Alliance to Save Energy is calling for energy efficiency to be perceived as an integral part of the future energy system with an ultimate aim to benefit European citizens.